Providing a long history of world class quality, these forged eye hooks are made to the German-origin, European DIN 7540 standards. These exacting standards define all aspects of the eye hook including design, material requirments, and final quality requirements. Each hook is provided with a manufacturer's certificate by serial number, documenting chemical and physical properties and completion of 100% ultrasonic and magnetic particle evaluation. 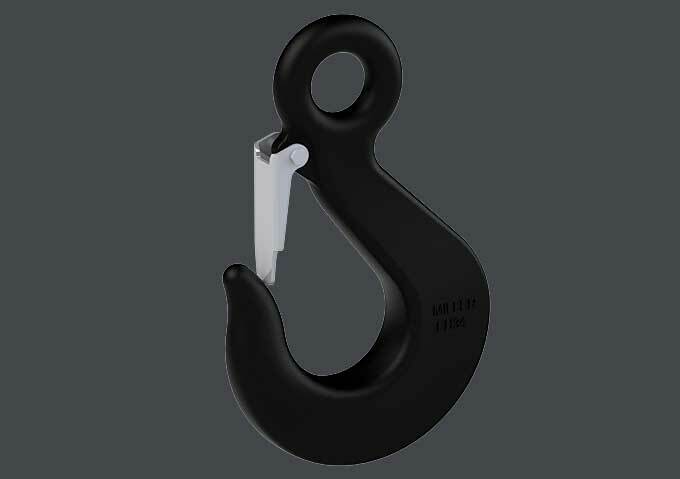 These eye hooks are Grade 80, alloy steel and are available up to a working load limit of 400 metric tons. All hooks are shipped with safety latches installed. Miller also provides DIN 7540 Forged Eye Hooks with remote latch control modifications for undersea ROV operations. See Specs p. 11 for Forged Eye Hooks per DIN 7540.